Chemical Process Equipment Built to Stand the Test of Time. Chemical and petrochemical processing facilities must overcome a number of complex fluid management challenges on a daily basis, many of which directly threaten the overall profitability of their operation. From equipment degradation caused by corrosive materials to difficult-to-manage dynamic fluids, operators in the chemical industry face a constant struggle to keep their processes running at their full potential. Anderson Process offers a number of products, all from industry-leading brands, as well as a number of value-added services designed to help counteract the problematic nature of chemical handling. From durable, corrosion-resistant pumps from Wilden and Ansimag, to metal hoses from Hose Master, we offer equipment able to withstand the wear associated with the transfer of acidic or basic fluids. Our aftermarket pump repair services, combined with our hose tracking, testing and refurbishment program, helps ensure operators that their investment in process equipment can provide value over the long term. 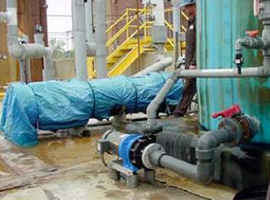 For chemical or petrochemical operations looking to increase their energy efficiency and maintain ideal product temperatures, our line of Standard Xchange heat exchangers represents an effective method to capitalize on proper waste heat recovery. Mixers from Sharpe and Hayward Gordon offer the ability to help control the rate of chemical reactions during material integration, along with the quality associated with two of the most respected brands in the mixer space. Driven by our mission to enhance the profitability of each our customers, Anderson Process offers both the products and the people to streamline any chemical processing operation. With more than 50 process professionals on staff, all with significant hands-on experience in the processing space, our knowledge equips us to add value for our customers in ways that other suppliers can’t. Combined with our service offerings and leading brands, this knowledge allows us to offer any chemical processing operator a complete package of integrated solutions specifically engineered to cater to their unique challenges.